Do you have a minute to spare to learn some English? Tom teaches you the difference between especially and specially! Give us 60 seconds and we'll give you the English! Hi everybody! I’m Tom from BBC Learning English. People often confuse the words specially and especially. Today, I'm going to tell you the difference. Both of these words are adverbs. Especially means 'in particular' or 'most of all'. For example: I like food, but I especially like sandwiches. This means that I particularly like sandwiches. They're my favourite kind of food. Specially, however, has a different meaning. Specially means 'for a particular purpose' or 'in a particular way'. So: This sandwich was specially made. Dan made a special sandwich just for me. Both especially and specially are adverbs. Especially means 'in particular' or 'most of all'. I like food, but I especially like sandwiches. He's often a little late, but he was especially late today. She looked especially beautiful that night. Specially means 'for a particular purpose' or 'in a particular way'. This sandwich was specially made. They had a chair specially designed for her size. The animals are specially trained to locate the mushrooms. This type of word is not a noun, adjective or verb! What kind of words are 'specially' and 'especially'? Which of these does 'specially' NOT mean? 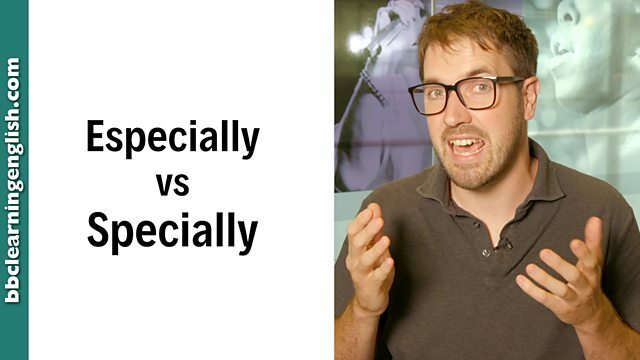 Remember the differences between 'especially' and 'specially'? If not, check the page again! Which of these answers is incorrect?